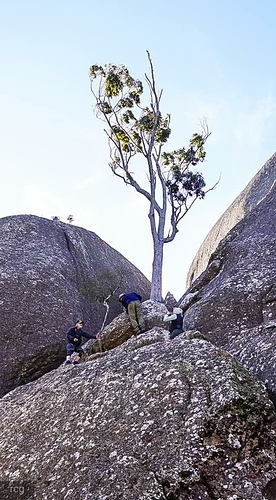 Hi all, I recently walked Mt Norman, but couldn’t find the start of the rock scramble up the last section. I walked from the left hand end of the junction, near the sign to the other end near the rock slab and back a couple of times without luck. The notes said there is a mark on the rock at the start but I couldn’t find it, very frustrating. It was late in the afternoon and I didn’t have enough time to explore too much so would like a few clues before going back. This is the first time I haven’t reached my target and really annoyed with myself. Photos might help. HI @jgmansell. No help for you, but I had the same problem when I was out there earlier in the year. I went for an afternoon run out there so I also didn’t have much time to search plus I was on my own so wasn’t sure whether I was going to make the final climb, but I would’ve liked to have at least found it. Thanks for the response Richard, it makes me feel a little better knowing that I am not the only one. I was alone too and had arranged for my wife to pick me up at the carpark so couldn’t spend much time searching or else she would have had the SES looking for me. Still hoping that someone can help out with this as I would like to make it to the top so that I can tick it off my list. You must be pretty fit if you can run up Mt Norman. Heading out at 4am tomorrow to tackle Logans Ridge, I hope I haven’t bitten off more than I can chew, did SE Ridge last year but I expect this to be more challenging. From memory the track contours around the southern side of the granite blocks that make up the summit. 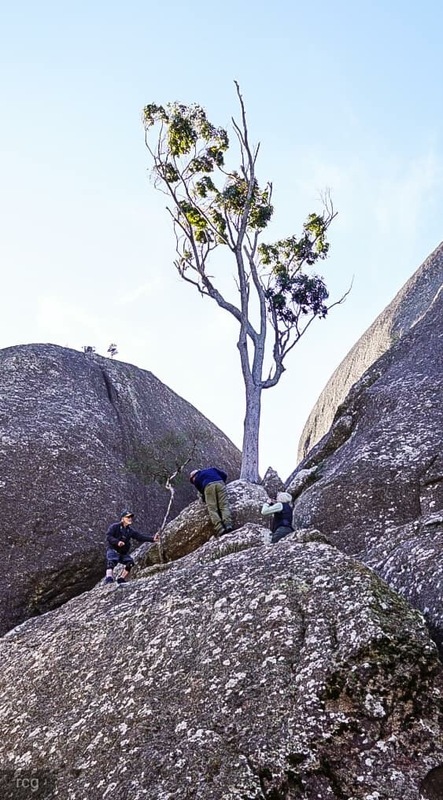 If you look up and spot the tree in this photo about 5 metres above the track, then walk left about 10 metres to where a large piece is “flaking” off the the granite (there used to be a faint painted/chalked arrow on the flake). This “flake” extends all the way to the ground on the left hand side, rises from left to right up towards a narrow ledge below that tree. You need to balance on the top of the flake and start edging your way across and up. I then had to use the trunk to help pull myself up to a wider ledge. From there the route finding is easy but things get spicy in sections. Thanks for the reply Michael, I tried the link but got a window saying the link had either expired, or that I had no access permission, is it a closed group? I will look at some of my pics and see if I can find the tree you mention and will also try the link later in case there was a problem. Either way, thanks again for the reply. How was Logan’s ridge? I’ve done SE a couple of times but haven’t stepped up to the next level yet. Thanks again Michael, I will check it out tomorrow. Logans was awesome, after reading the blogs I was prepared for the worst, but pleasantly surprised. Neither of us had done it before, and my buddy doesn’t like heights but was prepared to give it a go. We made it to the top in exactly 4 hours including plenty of photo and rest stops, and I am 69. If a spot seems too difficult, look around and there always seems an easier option, even if you need to backtrack a little. The secret seems to be to stay as high as possible. The page you requested cannot be displayed at the moment. It may be temporarily unavailable, the link you clicked on may be broken or expired, or you may not have permission to view this page. Found the pic Mike, thanks, should make it easy to find next trip. Hi Richard, Thanks to Michael, the start of the summit route is right near this tree. Should make it easy to find next time in Girraween.